If humans have any hope of sticking around on Mars for longer than a few days, they’ll need some form of power to sustain themselves. A successful test in Nevada has demonstrated that that power could be nuclear. You may remember that human astronauts walked on the moon only a handful of times back in the 1960s and 1970s, and never for longer than three consecutive days. Longer missions planned for Mars, like the one depicted in Andy Weir’s The Martian, would require a power system—one that can handle the planet’s frigid nights, dust storms, and a more distant sun. Those are the problems NASA’s Kilopower project hopes to solve with a compact nuclear fission reactor that uses a uranium-235 reactor core “roughly the size of a paper towel roll,” reports Reuters. The reactor would provide 10 kilowatts of power, “enough to run two average households... continuously for at least ten years,” according to a NASA release. Four units would be required to operate an outpost, it continues. You may have heard about President Trump’s plan for NASA to set its sights to sending humans back to the moon. 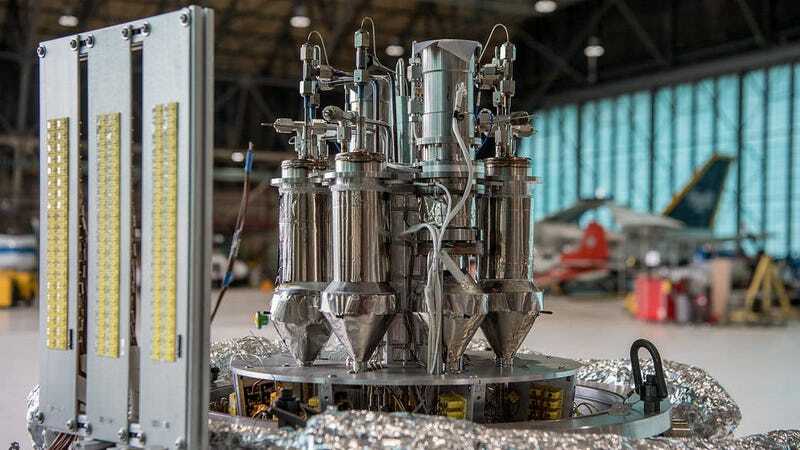 A miniature fission reactor could work on other extreme environments, including the moon, said Lee Mason, NASA principal technologist for power and energy storage for power and energy storage, in a release.